We were shopping the other day and saw this set of signs (a single unit). Believe in the wonders of tomorrow! Doesn’t that describe many of us who work for associations and other nonprofit organizations? I once worked for a large national association which was considered the model for other organizations within its industry. For more than 20 years, the core vision of the organization was crystal clear. Those who believed in that vision joined. And, the organization prospered. Then in the mid 1980s, a financial crisis hammered the industry. Under pressure from a few within, the association changed its policy positions (in a way that was the direct opposite of its core mission). Regardless of whatever new policies the organization tried, no more than a third of the members accepted. By the 1990s, dissent decended within the board and its chapters; staff turnover increased and the association floundered. Today, that national association has only about a third of the membership it once had and it is no longer the model for the industry. What happened? It abandoned its core vision and beliefs. 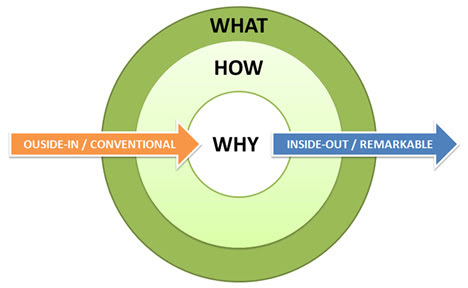 I thought of this as I watched Simon Sinek’s TED talk from his book, Start with WHY, How Great Leaders Inspire Action. Sinek uses this “golden circle” to illustrate his points. “By ‘why’, I mean: what’s your purpose? What’s your cause? What’s your belief? Why does your organization exist? Having a clearly defined Why and emotionally connecting it with your audience moves the association forward.